Showing 4 articles from March 25, 2013. Dr. Steven Hill of South Bend became a patient March 17 after suffering burns to his legs. It’s not set in stone yet, so it may never happen, but a marijuana growing plant has signed a lease to operated on public property in Raymond. The Port of Willapa Harbor has given the go head with lease with a well-known Seattle restaurant and night club entrepreneur, Marcus Charles, who owns the Crocodile Café, 360 and Juju. If it flies, it’ll be a first for the state. 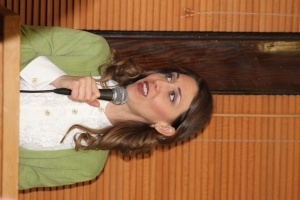 Photo by Sally Kunke U.S. Congresswoman Jaime Herrera Beutler addressed a full capacity crowd a Saturday night’s Lincoln Dinner. The popular in Pacific County Republican talked about the national debt and the image of the party. SOUTH BEND – Saturday night’s Pacific County Republican Party Lincoln Dinner at the Community Center was packed to full capacity to hear Congresswoman Jaime Herrera Butler and keynote speaker Alan Gottlieb. South Bend’s Karla was honored as the Pacific County Republican of the Year. Webber is a State Committeewoman. Verda May Hudnall, a longtime Willapa Harbor resident, died Monday, March 25, 2013 at the Willapa Harbor Hospital in South Bend; she was 82. Verda was born March 5, 1931 in South Bend, Wash. to Charles and Folda Marie (Dockery) Hunter.